A diamond-cutting factory is to be opened at Wrexham, Wales, and will employ disabled soldiers. A report to this effect has been made to the Bureau of Foreign and Domestic Commerce by Consul H. L. Washington, stationed in Liverpool, England. "A diamond-cutting factory is to be opened at Wrexham, Wales, the purpose being the employment of discharged soldiers who were disabled in the war. Under the present plan such men will be able to earn as much as $29.20 a week. A preliminary training of six months is arranged for, during which time these men will be maintained by the Ministry of Pensions. Upon becoming skilled in their parts, they will be passed into the regular employment of the factory. The ordinary pension will, of course, continue. "The scheme, as reported at the present time, is under the control of the Ministry of Labor Training Department. About 30 men will be employed at first, and this number will gradually be increased to 150. The factory is now in course of construction. The machinery has been installed, and work is expected to start in a few weeks. The organization has purchased 69 acres of land on which it is proposed to erect houses for the workmen employed in the factory." The Wrexham factory was one of four opened at this time in the United Kingdom, the others being located at Fort William, Brighton, and Cambridge, under a joint venture between the British government and Bernard Oppenheimer and his partners, the diamond brokers, Lewis and Marks. The scheme, however, was short lived, owing to the death of Oppenheimer coupled with the great depression, the factories closed in the very early 1920's. Bernard Oppenheimer, who was created a baronet in the 1921 New Year Honours, and who died suddenly six months later at the age of 55., was the brother of Ernest Oppenheimer of De Beers fame. This appears to be the earlier business to that of Eliza White (see above post). If there is one thing more than another for which Newport is justly celebrated, it is the preponderating display of beautiful shops which, in the majority of cases, although the town is of such antiquity, are associated with fine new buildings. 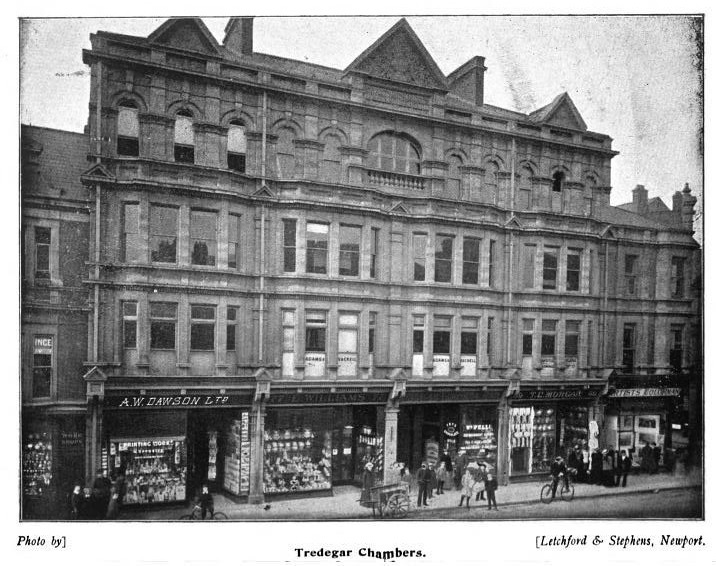 One of the most striking piles is the block of buildings known as Tredegar Chambers, where we have a collection of high-class businesses; and although the frontage of the windows may at first sight not seem more than ordinary, it is only when the interior is entered that the great depth running into 50 or 60 feet is appreciated. From the accompanying illustration it will be noted that amongst others the following firms occupy ground floor premises for shops. Beginning from the left hand, the first name which appears is that of Mr. C. Ince, the old established Jeweller, Gold and Silversmith, and Watchmaker, who for many years has done a high-class business in the town and county. James Hamilton, a journeyman jeweller, was charged with stealing a brooch, value 15s., which as bailee he converted to his own use. The jury returned no true bill, and the prisoner was accordingly discharged. An unsuccessful attempt was made late on Saturday night to break into the lock-up shop of Messrs. J. Elliot & Co., watchmakers and jewellers, Royal Arcade, Cardiff. WILLIAM, JONES, & SON (W.W. Jones and J.A. 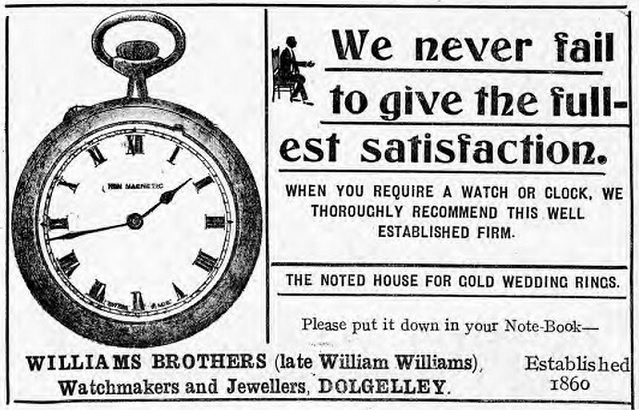 Jones), 22, Bangor Street, Carnarvon, watchmakers and jewellers. Mutual dissolution, January 1st, 1927. Debts by J.A. Jones, who continues the business. 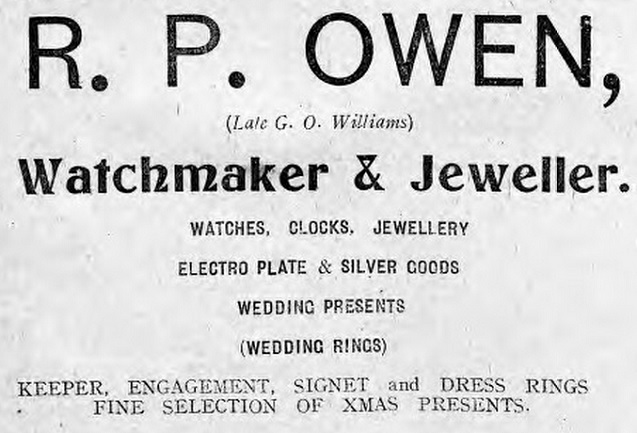 Edwards, William Jones, Church-place, Penrhyndendraeth, jeweler. Adjudication: May 16. Later to become Sir Zachariah Wheatley, , Kt. 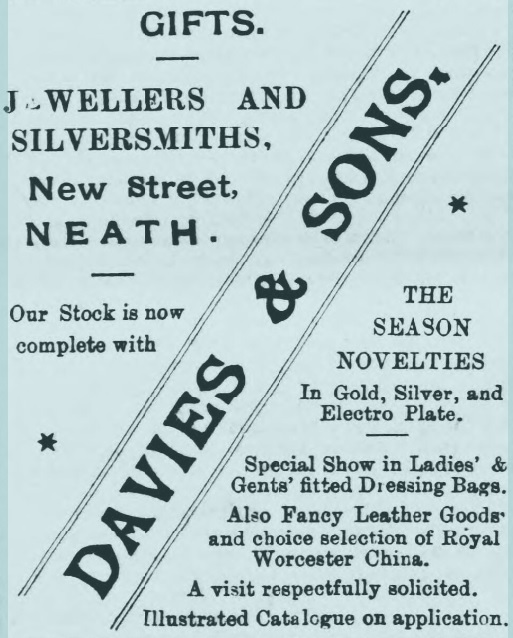 Bach., J. P. Mayor of Abergavenny 1914-19. His son was the painter, etcher and engraver, John Wheatley. Zachariah Wheatley (1865-1950) entered his mark 'Z.W' contained within a lozenge, with the Sheffield Assay Office on the 22nd August 1895. Notice is hereby given, that by an indenture, dated the 23rd day of December, 1886, made between Frederick Filippini, of 22, Market-square, Pontypridd, in the county of Glamorgan, Watchmaker and Jeweller (thereinafter called the debtor), of the first part, Michael Joseph Platnauer, of the city of Bristol, Wholesale Jeweller, Elizabeth Kaltenbach, of Pontypridd, Glamorganshire, Widow, Amos Daniel Fear, of Birmingham, in the county of Warwick, Wholesale Jeweller, and Simon Barnett Simmons, of 53,Vittoria-street, Birmingham aforesaid, Manufacturing Jeweller (hereinafter called the inspectors), of the second part, and the several persons and companies being creditors of the debtor, whose names are appended in the schedule thereto, of the third part, the said debtor conveyed and assigned unto the said inspectors all and singular his estate and effects whatsoever and wheresoever, upon the trusts thereinafter mentioned, for the benefit of the creditors of the said debtor; and the said inspectors hereby give notice, that all persons having any claim against the estate of the said debtor must, on or before the 14th day of December, 1887, send in particulars of the same to James Smith Pitt, 15, John-street, Bristol, Chartered Accountant, and be prepared to prove the same, otherwise they will be excluded from all benefit under the said deed—Dated this 17th day of November, 1857. W. E. PARRY, Solicitor acting in the Matter, Bristol-chambers, Nicholas-street, Bristol. 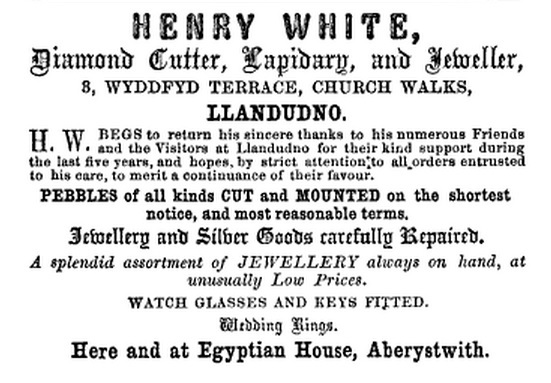 Long, William Henry, 62, Adam Street, Newtown, Cardiff, Watch, &c, maker. May 30. £42, &c. Given to Isaac Samuel. 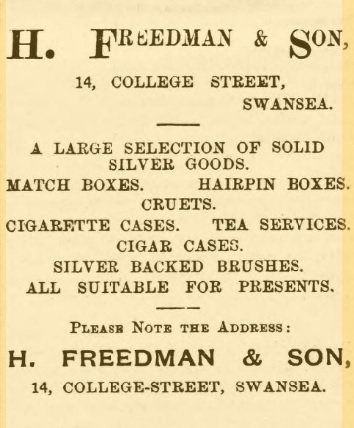 Evans, William, Bridge Street, Pontardulais, Glamorganshire, Watch, &c, maker. June 2. £14, &c. Given to William Usher. Grieshaber, Augustin, High Street, Pontypool, Monmouthshire, Watchmaker. June 10. £7, &c. Given to Aaron J. Jacobs and another. Mr. W.A. Frattini, for many years a jeweller in Windsor Road, Neath. He died at Llandilo, Carmarthenshire, where he had been living in retirement. He was 78.